OK, we’ll get the cliché out of the way first; apparently Sarah MacDougall’s name has to be prefaced by ‘Swedish-born’ in every review of her work. In this case, it helps to explain why there’s a Swedish-language song on the album (and a particularly beguiling one, at that), so I’m claiming that there’s a justification this time, but let’s just start with a bit of background. “Grand Canyon” is Sarah’s third album, following 2009’s “Across the Atlantic” and the award-winning 2011 album “The Greatest Ones Alive”. A quick look at the credits shows that the sound of the album is very different from her previous works; besides MJ Dandeneau (bass and double bass) and Shawn Killaly (drums and percussion), there’s a long list of guest singers, and players covering brass, keyboards, guitars as well as a string quartet. The album’s first song opens with sparse, almost martial, drums and acoustic guitar and builds up with addition of bass, keyboards and multi-layered vocals to a climax followed by the reiteration of the first verse. “I Want to See the Light (Lost from our Eyes)” is the first exposition of a theme which recurs throughout the album; there’s a much simpler life which we could go back to if we chose to. “Sparrowhead” is a much more percussive affair, again looking back to simpler times, which builds to a climax with a mantra-like vocal and a trumpet riff; there are a lot of elements new to Sarah’s work, but it all fits together perfectly. “Malmö I Mitt Hjärta” (yep, it’s Swedish but the sleeve notes have a handy translation) is a bewitching piece, with echoes of Sigur Ros, carried along on minimalist percussion and a lovely string quartet arrangement, all supporting a powerful vocal performance; it’s utterly compelling. And the title track; well it’s the poppiest song on the album, with skittering percussion, keyboards, clean and dirty guitars and a melody that just grabs you and won’t let go; and it’s about going back to something more simple. “The Story of Pippi and Lionheart” brings out another of the album’s themes, the powerlessness that we feel in dealing with real world with a series of fantasies identifying with superheroes from Pippi Longstocking to Robocop; it’s a relatively straightforward song, which is followed by the most complex song on the album, “Baby It’s Only Rock ’n’ Roll”. We’re not talking about rock ‘n’ roll music so much as the lifestyle, and the song bears this out, starting with finger-picked guitar and strings, moving through another martial drum pattern until a snare backbeat finally appears in the third chorus to hint at r’n’r before dissolving into a string quartet to close the song. This song and the remaining two, “Devil’s Gap” and “2012” feel like a trilogy dealing with different aspects of the same failed relationship although “2012” brings the album to a positive close with massed vocals and brass. 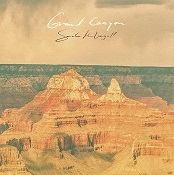 “Grand Canyon” feels like a big musical step for Sarah MacDougall; the acoustic guitar is still there, but it’s joined by poppier keyboards, percussion and string quartet providing support for her emotive songs and distinctive voice. This is a little classic of an album packed with powerful lyrics, catchy hooks and evocative arrangements. “Grand Canyon” is released in the UK on August 7 on Rabbit Heart Music Music (RHM02) and Sarah will be touring in November 2015.